End the battles over getting your child to the table and learn how to help your child have a healthy relationship with food. 7 picky eater tips that can be total game changers. Creating a positive meal-time environment can be challenging for any parent. In many homes, mealtime has inadvertently fallen to the bottom of the priority list and routines and structure around meals just doesn’t happen. When parents try to enforce a routine at some time, it is often met with grumbling and it can be easy to give up. Or, maybe you are a parent with young children, or have a picky eater, and despite the structure you have always tried to enforce, meal time is stressful to say the least. Whatever the case, there is tremendous value in creating a positive mealtime experience for everybody. As I already mentioned, it is a critical part of the foundation for a varied diet, and research sites higher emotional and intellectual quotients in kids that routinely sit down and eat dinner with their families! 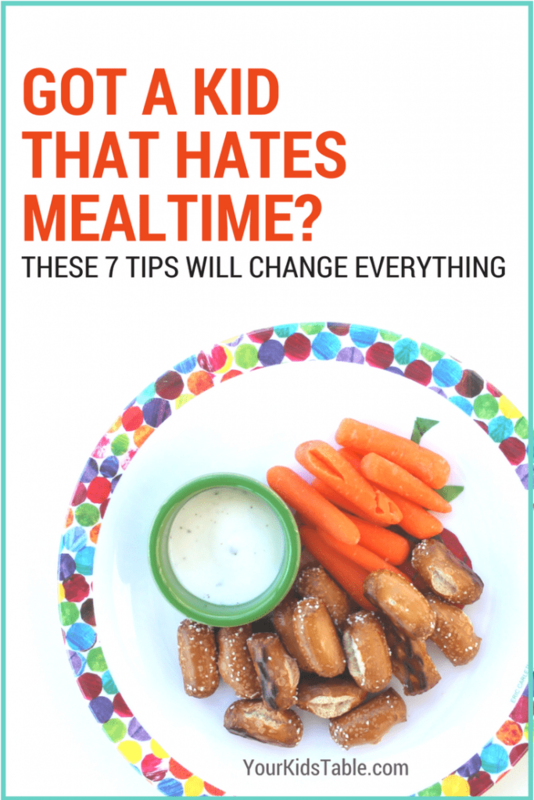 Let’s talk about 7 tips to creating a positive mealtime for the whole family, which also happen to be tips for picky eaters too! #1 Tip for Picky Eaters: Start off on the right foot! The first step to creating a positive mealtime and tip for picky eaters is to get your child to the table without any drama. The best way to do that is to help them with the transition, especially for kids that aren’t used to having a routine or have anxiety about eating. Depending on the age of the child, give them a reminder a few minutes before it is time to eat. The older the child is the more in advance you will want to do this. For very young children, it may only be a few minutes and although they can’t understand the concept of time fully, they will understand that it means SOON. (ex: “Olivia, 2 minutes to dinner.”) For some kids, it may be helpful to give several reminders or even set a timer. If they are still getting upset despite the reminders, try to make them feel like they have some control over the situation by making a reasonable accommodation (ex: “Do you want to eat at the kitchen island or at the table?”, “Do you want to sit in your booster or in your high chair?) 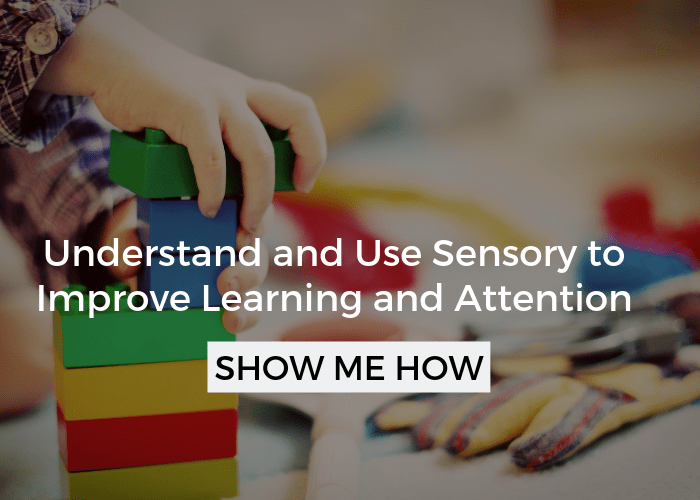 In addition to making them feel like they have some control, it will also help to direct their attention to something else. It is also important to think about what you are asking of your kid from their point of view. Is it a beautiful day and they have only had a few minutes to play outside before you are asking them to come in and eat? Could you serve the meal before going outside or have a picnic instead? Or maybe, your child has just gotten out of their car seat and doesn’t want to be confined in another space just yet… Can you give them 15 minutes before expecting them to come to the table? I could go on and on with different scenarios, but the point is to think about if you are asking too much of them in the moment they refuse to come to the table. 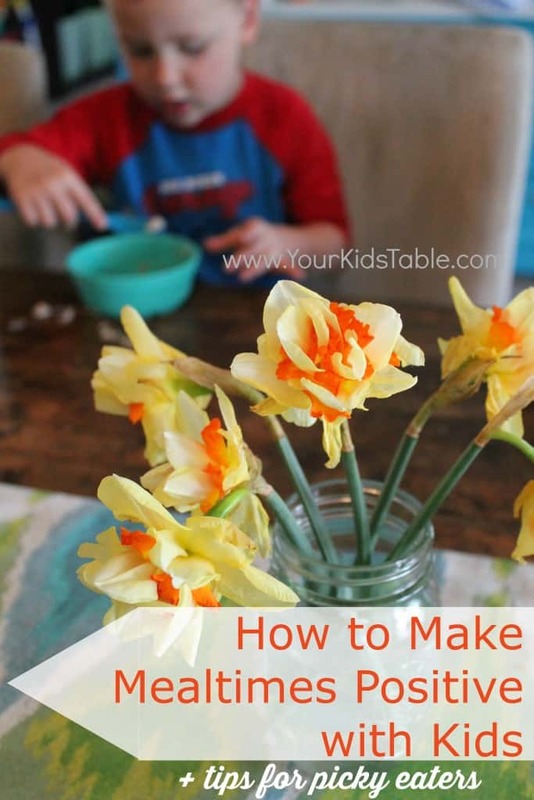 Find even more on how to keep your child seated at the table (and snag a free printable too). 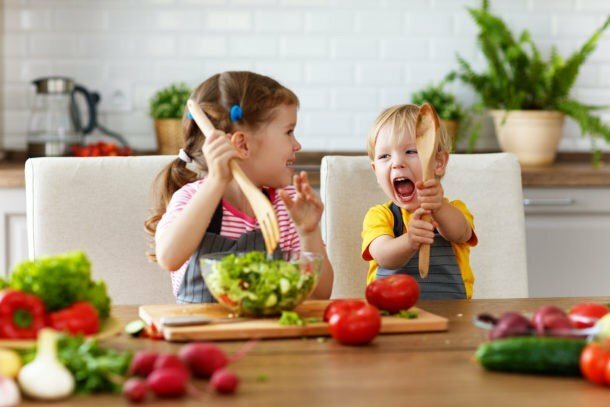 Being present with your child to help them explore new foods and having enjoyable conversations during a meal typically hinges on how prepared the meal it. 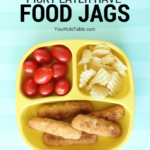 As a mom of 3 young children, I know as well as anyone how hard it can be to have our entire meal set up when I call out “time to eat”, and to be honest, I often fail here. However, having all or most of your child’s (and your) meal set up so you can peacefully sit down together will go a long way in creating a positive environment. It is often those first few bites that can make or break a meal. 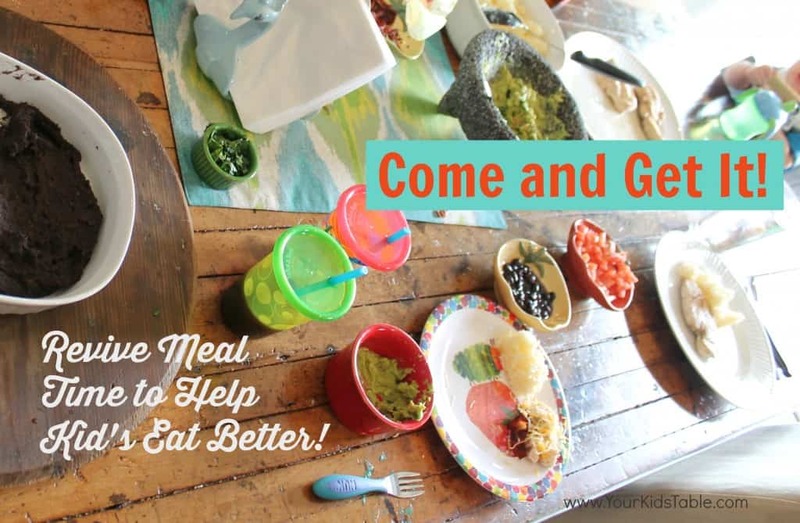 If you are still rounding up other kids, or setting the table, you may miss a valuable opportunity to get them to eat something new or non-preferred because they are the most hungry at the beginning of the meal. Plus, you will be calmer, more attentive, and may actually get to eat! Of course, not all is lost if by the time you sit down they have already pushed their plates away, and some kids may be more likely to try something at the end of the meal. It really takes a lot of patience and a little planning ahead to make it successful. Once the meal has started, feel free to comment on what you are eating and acknowledge if there is a new or non-preferred food (ex: “Look at those green little balls (peas), they squish a little when you bite them). You can tailor the names for preschoolers and even toddlers as they love to call food other things or relate it to something they know. While you will be “commenting” occasionally about food, don’t let it dominate the conversation, especially for the picky eater’s sake. There is nothing worse than feeling like you are under a microscope for the whole meal or having someone nagging you to “try the peas”. Use this time to talk about other topics your family is interested in or review/plan your day. Remember you want to create an atmosphere that i enjoyable. Read a lot more about why its so important not to pressure our kids to eat. 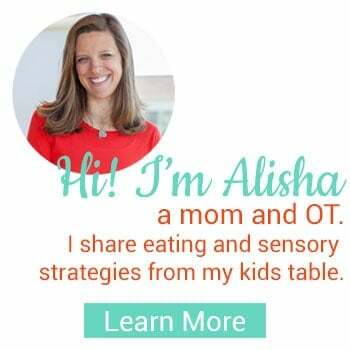 Although I just described how to talk to your kid’s during meal time, I know personally how great the temptation is to still multi-task. You may be spent and that 5 minutes may be the only ones you have to look through your magazine or respond to an email or set up the doctor’s appointment, and while I TOTALLY GET how important any of those things may be, I would ask you to think twice. We all know that our kid’s take in EVERYTHING that we do, and when we bring electronics or reading materials to the table it certainly sets the precedent that this is acceptable for them AND that you have something else you would rather be doing. Also, if you have more than one kid their behavior can get out of control in a hurry without you being fully present. This point was illustrated right before me a few years ago while I was having lunch with my kids at a children’s museum. Sitting nearby was a mother with two kids a little older than mine. The mom handed them their packed lunches and then pulled out her magazine and read it while they ate. Nobody talked and the kids picked at their food and looked around. Please understand that I’m not sharing this story to judge this mom, maybe she just needed to read her magazine THAT day, but the reality is I see this kind of thing a lot. If we aren’t interacting with our kids regularly during meals then we aren’t teaching them about the importance of eating, creating a positive environment, and we are likely missing opportunities to explore new or non preferred foods with them. Let’s imagine that you are having a relatively stress free meal with your kid, but they haven’t ate as much as you would like. You have to decide whether to encourage more eating or be done. 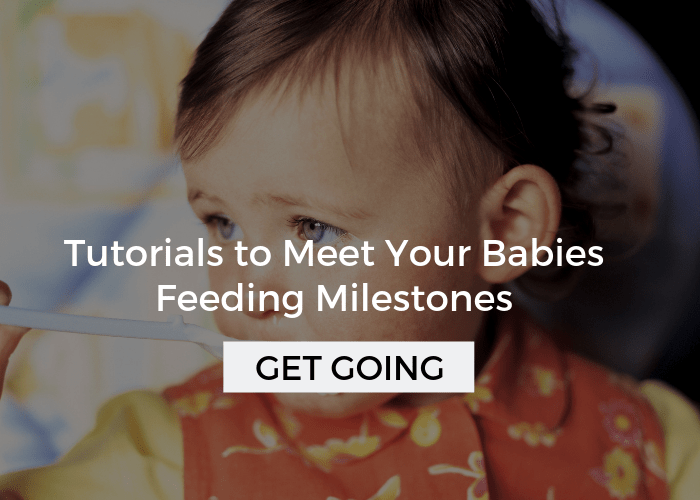 When you begin to notice your child is losing interest in eating, take a minute to think if it’s worth encouraging another bite of food. Sometimes this is all it takes to send a toddler or preschooler into whining or tantrums. yways and now your kid may be walking away from the meal with a negative impression despite how positive the rest of the meal may have been. At the same time, I have to admit this is kind of a dance, sometimes our kids try to weasel out of a meal to get back to playing or because they are distracted. In these cases, they may need some more encouragement. Finding the balance can be difficult. It’s as if there is a window of time that you can end the meal positively, and finding it may take some experimenting on your part. Pay close attention to how your kid responds to requests to eat more, so you can judge better on when a meal is over. Read more about balancing family meals with a picky eater. eat one or two more bites mindlessly anyways. Also, we want to teach our kids to stop eating when they are full, not when their plates are empty, as many of us adults do. Their body may be giving them very legitimate signals that they don’t need to keep eating (even though we think they should eat more), and that is a good thing! We want them to listen to those signals so they don’t become over-eaters or have an unhealthy relationship with food. If you feel like you need more specific guidance on this topic see Toddler/Preschool Portion Sizes. If your child actually refuses to eat at all, I would do a mental check and make sure they are hungry and that there is at least one preferred food at the table. Gently encourage, but don’t force, and as difficult as it may be, don’t let them feel your stress, it will only exacerbate the situation. If they don’t eat, then they don’t eat that meal. If you are finding yourself in this situation often, despite following these strategies and my my healthy eating habits for kids, then you may need more advanced strategies which can found in this advanced picky eating tip. Although I want you to respect when your kid is done eating and end on a positive note, I don’t want your kid to try and, dare I say, manipulate you. It is reasonable to expect a child to sit 15-30 minutes for breakfast, lunch, or dinner and 10-15 minutes for a snack. I would avoid going over 30 minutes, especially with baby’s and toddlers, it is just too long for them to be stuck in a chair and focused on eating. If your kid is spending too much or too little time in the chair, slowly increase/decrease by 2-3 minutes each day or week, depending on how stressful it is to make this change. 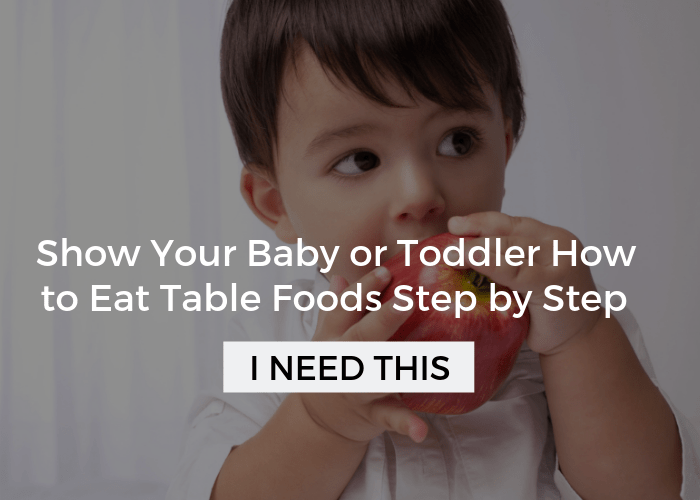 Even with following these strategies, there will be times when mealtime isn’t exactly positive. Don’t beat yourself up if you think you made a wrong move and it all ended with whining or yelling. It won’t be long (just a few hours, actually) before you have another shot to try again. 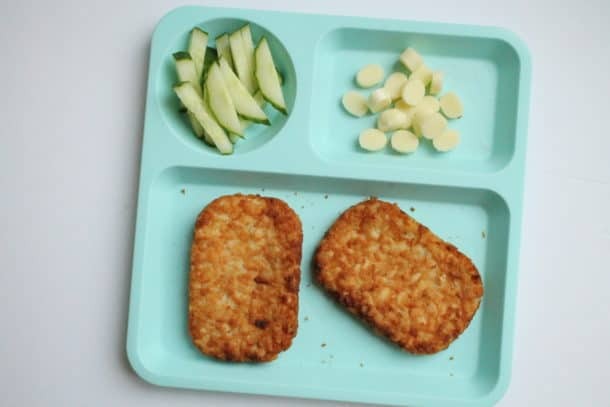 Although mealtimes can become emotionally draining it is important to think about how stressful the actual act of eating may be for your child. Eating might be difficult or uncomfortable and can cause anxiety, which of course leads to avoidance. 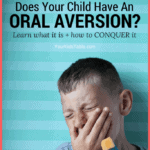 In these instances, kids will often try stalling tactics before meals or even tantrum. If getting your child to the table is a battle, and they are mad or crying by the time you get them there, it is pretty likely they are going to eat poorly or not at all anyways. Plus, you will be so spent that you will end up giving in to their demands just so they stop yelling or crying and eat something. In these instances, you may have to take a slower approach to making these changes. Maybe you need to eat at a kid’s table or even the coffee table to start. As your child begins to tolerate this new structure, you can slowly increase the demands by slowly getting them to the dining table. It is also critical for a picky eater to have one preferred food at every meal. If your child sits down to see a plate of foreign foods, you will likely lose them and the stress will mount quickly. 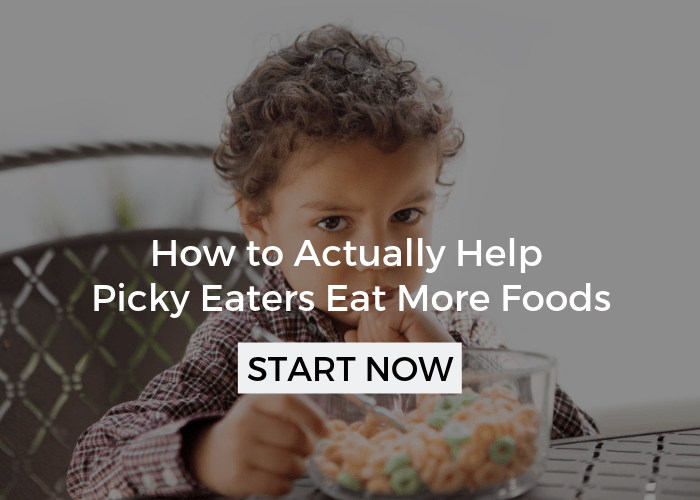 Lastly, addressing any underlying issues that could be fueling picky eating will help you help your child. If you’d like to dive deeper and get a plan to start overcoming picky eating, get a seat in my free workshop: 3 Keys to Turn Around Picky Eating! Children respond well to having a routine because they can anticipate what is coming next. Giving kids choices will allow them to feel like they have some control, which is very motivating. Planning ahead will help you head off tantrums and quibbles. Eat together in a non distracted environment to encourage interactions with food. Space meals 2.5 to 3 hours apart and always have at least one food your child prefers. Try not to focus on the quantity of food your child is eating. Hover or tap any image in this post to pin it to your favorite board! When you say make sure there’s at least one thing on the table/plate you know they like, what do you do when they ask for more but haven’t tried any of the other foods? E.g. Sometimes we put cheese on the plate if we think she doesn’t like any of the elements of the meal…do we just allow her to eat as much cheese as she likes or limit it until she has eaten some of the other foods? She really struggles with cooked meals. We have a different meal every evening (based on a 3-4 week rotation) and we make sure 2-3 of the meals each week are pasta based but she won’t eat anything other than the plain pasta and cheese. If the pasta has the tiniest amount of sauce on it she won’t eat it. Don’t know what to do. Hi Rachel, this is a great question! So, I will tell you that there’s some different school’s of thought on this, but I believe in and use a well-researched no-pressure approach that does allow them to eat as much of their preferred food as they want. You can read a lot more about it in The Best Picky Eating Strategy, there’s a part two to this also that will thoroughly answer all your questions. Let me know what you think! Jenna, I hear you… I know how hard it all is, truly! The first thing I can tell you is to start by making meals positive. Don’t worry about getting a ton of food into him right now. One thing at a time. I highly recommend reading my eating basics in the menu bar and implementing all of those strategies to get started, and slowly make your way through more of the articles that get into more specific strategies. Let me know if you need more help along the way!